All roads are leading to Mozambique, as over 600 academicians and practitioners from more than 30 countries around the world are gathering for the 4th RUFORUM biennial conference. It was previously Uganda in 2012. The theme this year held is “Celebrating the Contribution of Tertiary Agricultural Educational Institutions and Partners to Africa’s Development”. 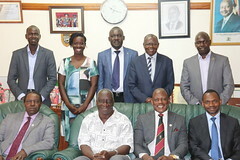 RUFORUM is a consortium of 42 member universities in East, Central and Southern Africa, with the core mandate to build a pool of high level scientists who are able to respond to the demands of small holder farmers. With specific focus on capacity building in tertiary education, RUFORUM has devoted its self to rising a new generation of dynamic and vibrant graduates able to address emerging challenges in relation to food security on the African continent. Through the Community Action Research Projects, RUFORUM links Universities to African farmers by carrying out action research in identifying and addressing food security related issues. The choice of Maputo as the host city for RUFORUM’s tenth birthday celebrations is no accident. This year marks the tenth anniversary of the signing of the Maputo declaration where heads of member states of the African Union committed to allocating at least 10 per cent of their national budgets to agriculture. Unfortunately, a few nations have been able to allocate the agreed amount of their national budget due to budget constraints and governments are under pressure from other sectors which are competing with agriculture. This paints a grim picture for the future of public investment in agriculture. It provides the education sector with an opportunity to invest in innovative cost effective solutions. In its 10 years of existence, RUFORUM has managed to train over 1283 Masters and PHDs students, most of who have stayed in their home countries to transform the agricultural sector. The conference this year is celebrating the milestones made so far and the ‘seeds of change’ sown over the past ten years. It also serves as a Platform for sharing and will purposely link and expose young researchers to a professional gathering while creating ground for new generation. Speaking at the conference are eminent personalities like Graca Machel, HE Nkosazana Dlamini-Zuma, Chairperson of the African Union Commission, and over 10 ministers from several African countries. The meeting is co-organised by the RUFORUM Secretariat, Eduardo Mondlane University, Mozambique Institute of Agricultural Research (IIAM), the Centre for Coordination of Agricultural Research and Development for Southern Africa (CCARDSA) and the Government of Mozambique. During the conference, various interesting themes are going to be deliberated on. These include but are not limited to the integration of higher education into strategic policy plans and instruments such as CAADP, MDGs. The integration of ICTs has ushered new paradigms in the practice of institutions of higher learning. The conference will create a platform for learning from each other and share best practices. Strengthening partnerships and collaboration will be made possible through the interaction of stakeholders and participants. Harnessing science and technology capacity for innovation in Africa is paramount at this point in time and will continue to be critical for the development of agriculture in Africa. Given the enthusiasm surrounding the whole event, it promises to be highly interactive, educative and substantial. It is our hope that during the conference, researchers, academia, policy makers, will be able to deliberate on issues that will take RUFORUM to a higher level. This is really great. Many people’s lives are changing in Africa due to improved Agriculture and Technology thanks to Ruforum.